10 days after my last vacation, I flew to Hawaii (that, by the way, takes 4 flights and 2 days). The plan was to meet Sean at the airport in Honolulu (he'd arrive from a conference in Florida at 2pm, I'd get in at 2:45pm). With bad weather in Florida, Sean was 90 minutes late for his connecting flight in Atlanta. After only being promised a flight to get in at 8pm the next day, he very luckily got the last seat off the standby list to get in to Honolulu at 9pm that night. So when I got to Hawaii, I took at cab to Sean's apartment where his roommate let me in and that night I picked Sean up at the airport. It went fine, but I suspect that exhausted, jet-lagged, having been carless for 4 months, in the dark, in an unfamilar city, being guided by cell phone, in the rain, does not constitute ideal driving conditions. We lazed around Oahu (and went to some very nice beaches on the North Shore), then went to Maui for the last couple days of the week. 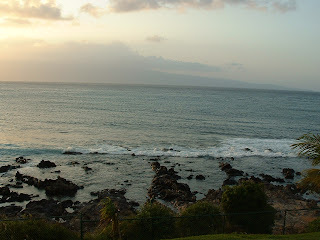 We stayed in Napili in West Maui, where from the shore you can see the islands of Molokai and Lanai. In the wintertime, these waters are full of humpback whales, but the whales were gone by the time we visited. Hawaii is the kind of place that's so beautiful that when you're not there, you can't accurately recall how beautiful it is. This is the view from the balcony of our hotel room. 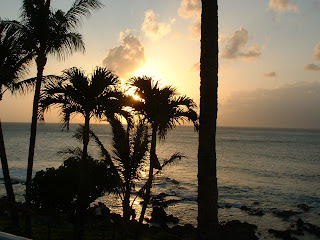 From here, at sunset, you can see sea turtles hanging out in the water, their heads bobbing out of the water. We'd heard about a snorkeling spot further up the coast and went to check it out. There are no signs, but must be pretty well known, since three catamarans full of snorkelers showed up while we were there. Driving along a winding cliffside road, we stopped and parked on the side, where a bunch of other cars had parked. A dirt path leads down to a closed gate with a sign that says "Private Property." The sign does not continue to say "Do Not Enter." Instead, it says "Enter at Your Own Risk," and there's a helpful footpath around the gate. The path goes through a tropical forest (it's also very pretty) and across a dry riverbed. The end of the path is an old concrete boat launch at this bay, Honolua Bay. Here's a photo. 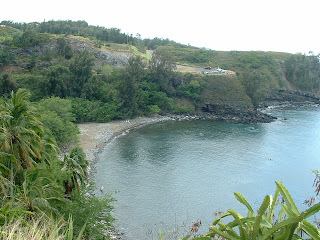 (The other side of that cliff is another snorkeling spot, which is also supposed to be nice, called Mokuleia Bay.) Facing the ocean, the right side of the bay has some amazing canyons of coral and fish; the water is very clear. There was also a ginormous school of fish that would swim around you. I think that the left side of the bay is also cool, but further from shore. At one point, one the left side, however, the coral was so close to the surface that I was little worried about swimming over it. The only downside to the spot is that it's pretty difficult to get in and out of the water. The rocks are very slippery and the best way to get back to dry land may be to beach yourself on them. 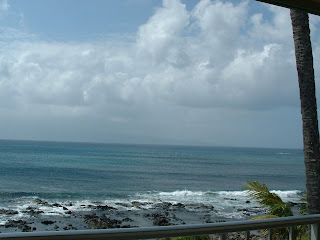 Back at our hotel, 2 resorts over is Honokeana Cove. The sign at the street says "Private Property. No Public Access." If you ignore it, and walk through the resort to the cove (not that we ever did this), there's a concrete path with a railing down to the water and the shore has a sandy bottom amid the rocks (so it's pretty easy to get in and out of the water). The water is kind of murky and the coral isn't that great and there aren't as many fish. However, swimming just a few minutes to the right side of the cove, you'll see an area where the coral/rocks don't cover the whole seabed and you can see the sandy bottom. And there we saw around 15 sea turtles. When we snorkeled here a couple years ago, I saw maybe 4-6 turtles and thought that was a great day. The turtles sleep at the bottom, hiding between and under the rocks. When I first got out there, I looked down and saw one on the bottom. I waited a few seconds to see if he was going to do anything. It didn't seem like it, so I was going to move on. When I looked up, I saw a sea turtle which seemed to have giant barnacles stuck on it right in front of me. We also saw a ginormous sea turtle which was easily longer than me (and probably 6 feet long). At one point, the barnacled turtle was swimming below this big guy, and he reached down and smacked the barnacled turtle in the head with a front flipper. The barnacled turtle got the messaged and swam further down. A couple times, a turtle was so close to me, I had to stop worrying about getting close to the turtles and worry about how to get the hell out of their way. I don't have any photos from snorkeling, but pictures probably couldn't accurately depict how cool it was.